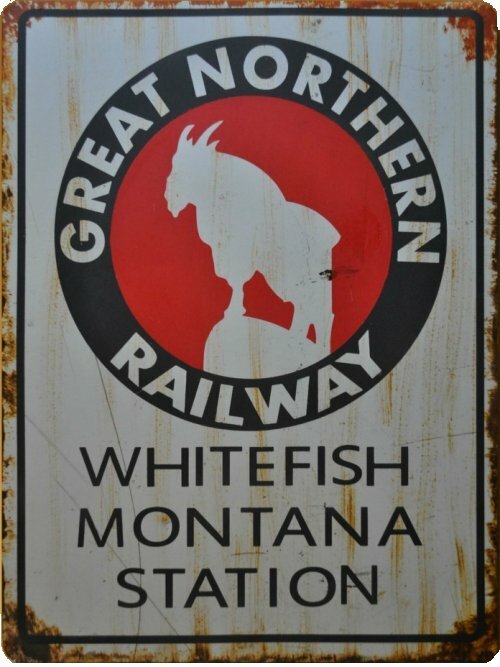 The Great Northern Empire Builder, East of Glacier National Park in Montana - ca. 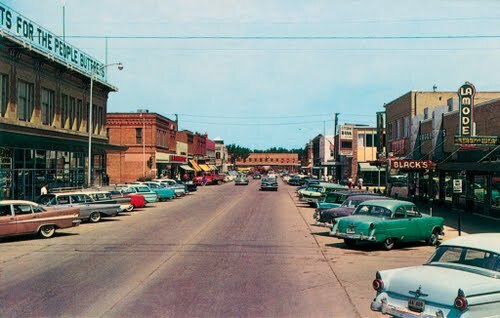 late 1950s. In 1957, at the end of August, Elvis, Scotty, Bill and DJ began their second of three, short, tours that year. This tour was in the Pacific Northwest and began in Spokane with dates also in Vancouver, Tacoma, Seattle and concluded in Portland. 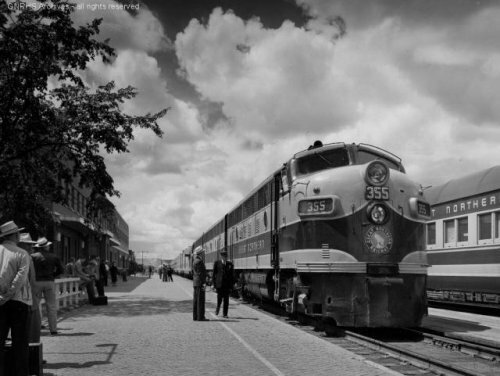 While Scotty, Bill and DJ drove from Memphis, Elvis and his entourage which included Gene Smith, Lamar Fike, George Klein, Cliff Gleaves, Tommy Young and Louis Harris, boarded the Panama Limited at Central Station on the 27th for the overnight trip to Chicago where they would board the Empire Builder. 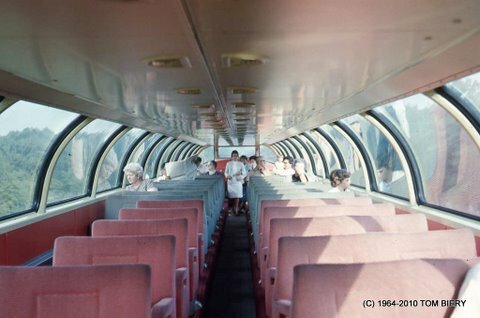 The Panama Limited was Illinois Central's sister train to The City of New Orleans with each immortalized in song, the former initially by Bukka White and Tom Rush and the latter by Arlo Guthrie. 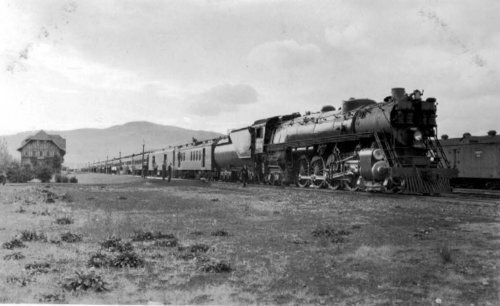 On the 28th they along with the Colonel and his entourage that included Tom Diskin, Lee Gordon the promoter who had booked this and the last tour, and likely Al Dvorin, who hailed from Chicago, and the rest of the opening acts boarded The Empire Builder for the trip to Spokane. 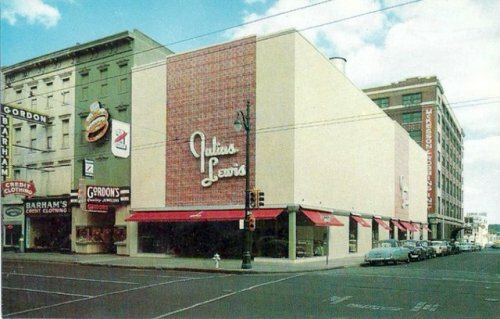 The trip would take them through several cities that Elvis and the boys had previously performed in, like La Crosse, St. Paul and Minneapolis, not to mention Chicago itself where they had appeared only several months earlier. 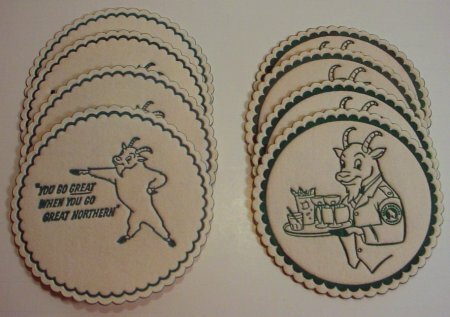 The Colonel, ever thinking of promotion, had likely tipped off the press ahead of time in several stopover towns along the way of Elvis' schedule through them. In several at least the crowds came out to greet him. Contain yourselves Elvis Presley fans. The sensational young singer who accompanies himself on a guitar and rotates his pelvis every which way is going to be in Havre for a few minutes on Thursday noon. Idol of millions of bobby soxers and some oldsters too, Presley will be on the Empire Builder enroute from Minneapolis to Spokane. There is no guarantee that the man who has wowed ’em will descend to the platform at the depot but chances are that he will be much in evidence and a large crowd is expected to be on hand to try and obtain his autograph and to see what he looks like. don‘t show up Thursday. The arrival time is 12:15 p.m. and departure time is 12:25 p.m.
Elvis Presley. movie star, television and stage celebrity who did it all with a guitar and a movable pelvis and a unique style of revivalist type of singing, will be in Havre for about 20 minutes Thursday noon. 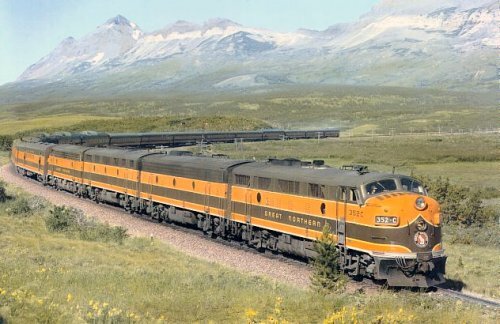 The youthful singing star will arrive on the Great Northern Empire Builder at 12:15 noon, enroute to keep a show engagement in Spokane. Presley has made two motion pictures, both a success at the box office, it was reported, and cut any number of records, all of which together have sold into the millions. His "All Shook Up" and "Ain’t Nothin' But a Hound Dog"-—both records still in demand among the teenagers and adults—confirmed Presley’s front - rank standing among popular singers and entertainers in this country. Thursday noon, when Presley stops in Havre until departure time about 12:30, swarming crowds of Havre teenagers and curious older people ere expected to be on hand to meet him. Presley, a tall, dark slim, handsome man in his early twenties, is said to have done as much as any top TV and stage artist to establish the Rock 'n Roll type of music in this country. 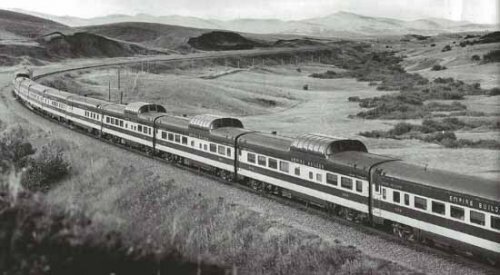 Much to the dismay of the crowd that had gathered at the station in Havre hoping to see Elvis during the stop on August 29, 1957, he didn't leave his compartment. WHERE'S ELVIS PRESLEY? 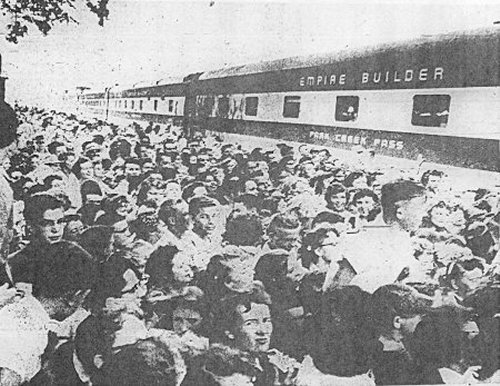 -- This is part of the huge crowd that turned out this noon to see Elvis Presley, the famous singer, when the Great Northern Empire Builder with Presley aboard pulled into Havre for about 20 minutes. The hundreds of persons on hand were disappointed when the singer kept to his compartment on the train, too tired to meet his public. However, Sheriff Deputy Al Holladay of Havre got to meet Presley and obtained an autograph for a youngster. Hill County Sheriff Deputy Al Halladay was the only person in Havre who got Elvis Presley's autograph and briefly interviewed the famous Rock 'n Roll singer at noon today. The biggest crowd of Havre residents ever seen at the Great Northern Ry. Co, station turned out to see Presley, and was disappointed. Halladey was able to see, Presley with the help of a conductor who took the deputy to meet the singer's manager in Presley's private compartment. "I told the conductor that I wanted Presley's autograph for a kid, and then he took me to the compartment." Halladay told a Daily News reporter. 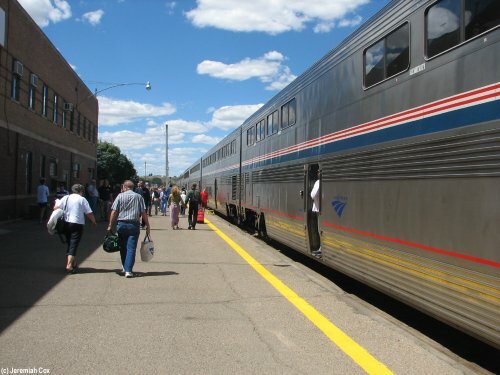 The Empire Builder pulled into Havre at 12:30 noon sharp and took 10 minutes to come to a halt. By then crowds, standing 30 deep, had formed in front of car 312, when it was learned that was Presley’s car on the train. When Halladay asked Presley for the autograph for a child, the famous singer declared, "I'm pretty tired." But he obliged with the autograph, attired in dark robe over light colored pajamas, and bedroom slippers. "He was having a glass of orange juice when I came up to him," the deputy explained. Halladay offered Presley his fountain pen and the singer took up a coaster on his breakfast tray and scribbled "Elvis Presley" on the saucer base. That satisfied Halladay, but Presley had second-thoughts, deciding that the first signature on the Great Northern coaster was too light in color. Bearing in mind that the autograph was for a child, as the deputy had mentioned, Presley took the coaster and again signed his name. Halladay boarded the car in front of 312, where most of the waiting crowd was densely, packed hoping to catch a glimpse of the celebrity. "I was taken through the car to 312 to Presley's compartment," the deputy stated. "What looked like strongarm men were posted outside the compartment." Mayor James Davey was on hand to officially greet Presley if and when he debarked from the train. The mayor stood in front of car 312, on the station pavement, waiting to meet the Rock ‘n Roll king. 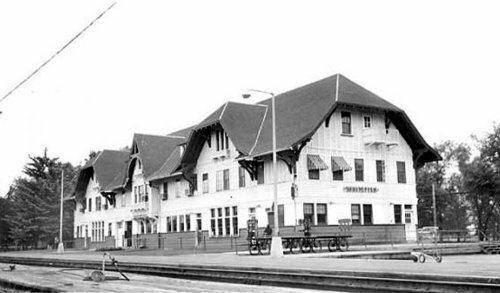 H. A. Swisher, Whitefish, a Great Northern conductor, who was waiting to board the Presley Train to go on duty, was asked his opinion of the size of the waiting crowd. "It's the biggest I've ever seen in the Havre station," Swisher said. He has been with the Great Northern 42 years as a conductor. 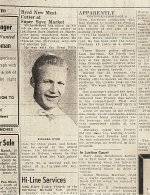 Three Havre police officers, Leon Davidson, Ed Divish and Woodrow McLain, who were on duty at the depot, to keep the huge throngs under control, after awhile were literally swallowed up by the packed crowds. 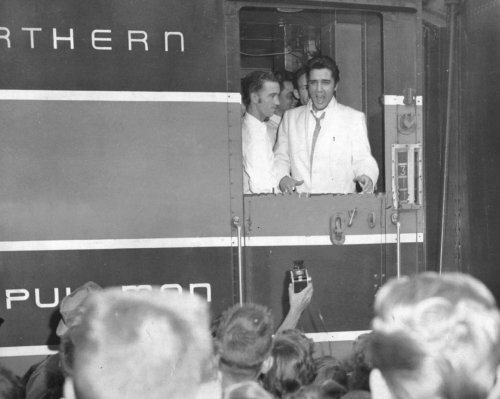 During the 22 minutes the train was in the station, with Presley still to appear on the car platform, the crowds took up the chant "We want Elvis!" at intervals. One passenger aboard the train, on the platform of car 312, volunteered that Presley was asleep in his compartment. That was when the chant first went up in a high-pitched chorus. About 50 percent of the crowds was made up of teenagers, about 40 percent being youngsters under teen-age, and some 10 percent comprised adults at the station. Halladay, asked why Presley did not meet the waiting crowds in Havre, said Presley told him he was exhausted from the riotous greetings he received in Minneapolis. Though Elvis explained his reasons for being tired and not greeting the crowd on "riotous greetings" in Minneapolis, nothing found in any of the papers of the day reported this. The crowd at the stop at Whitefish around 6:00 P.M. later that day had better luck. 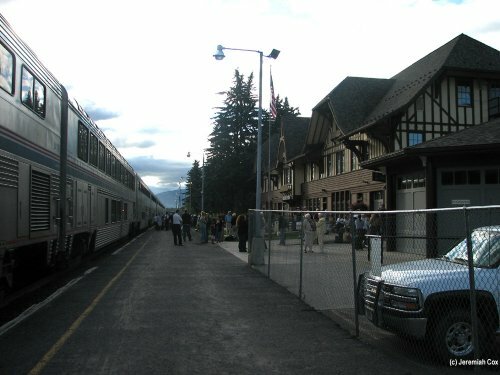 Elvis Presley fans were "All Shook Up" yesterday when he appeared in a white sport coat (no pink carnation) as his train, long as a "Hound Dog," stopped briefly in Whitefish. Fans yelled "Love Me Tender," but couldn't tell if he was wearing "Blue Suede Shoes" since he didn't leave the train. He was on the way to Spokane for a special show. Elvis Presley stopped for a few minutes in Whitefish last night and "the call of the wild" was heard for blocks. But it was those on the other side of the cage that were giving the call. Presley, whose eccentric singing style has brought him to a unique position in American entertainment, came to the door of his railroad car to wave to the fans a few moments before his train, the Empire Builder, left. He wisely did not step into the crowd to sign autographs. A crowd, estimated at 800 composed mostly of teenage girls with a liberal sprinkling of jealous boy friends, small children, and curious mothers and townspeople jammed the station platform long before the train pulled in at about 6 p. m.
Pony tails and Italian cuts, skirts, sweaters, starched dresses and Bermuda shorts - the clothes were varied, but the girl's excitement was the same. Presley, a handsome young Mississippian, seemed to be used to mob scenes. He stayed on the steps of the railroad car and the only personal contact made was by a few high-jumping girls who managed to touch his hand. This apparently was enough to satisfy them and excite their friend's admiration and envy. Whatever Presley has, it certainly seems to be in big demand by the bobbie sox brigade. Special thanks to Dave Martens for the Havre Daily News articles and inspiration for this page. 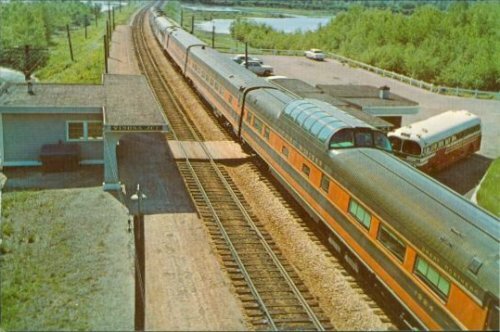 Check out views from the observation cars and other photos from a 1964 Empire Builder trip (and detour) courtesy of the Great Northern Archive. This week I received email from a couple of fans in Lake Oswego, Oregon that I thought would be worth sharing with everyone. I am so pleased about this opportunity to share my story and tie! Karen has done a wonderful summary of my story (see here). 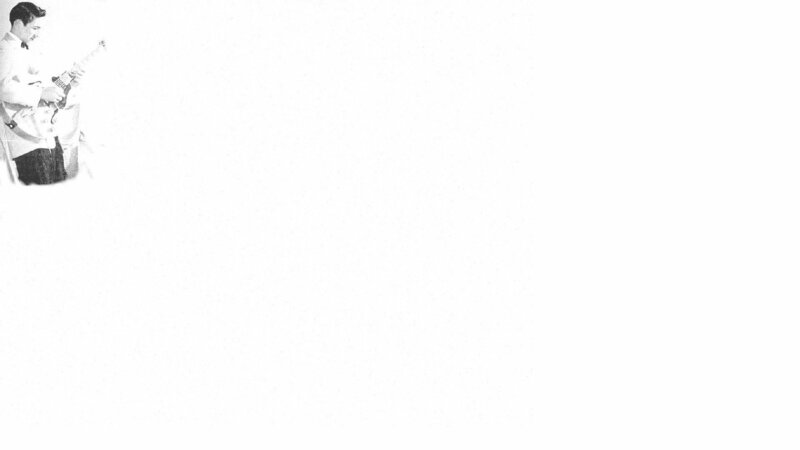 However, there are a few additional facts I would like to share. My name at the time was Dorothy (Dolly) Petersen and my two teenage companions (older than I) were: Barbara and Mary Lou Lenz. Elvis actually had a pen and a comb in his left jacket pocket ( you can see the top of the pen on the photo!). After signing his autograph on paper for us, one of my girlfriends asked for the pen. The other asked for his comb (also in the pocket). 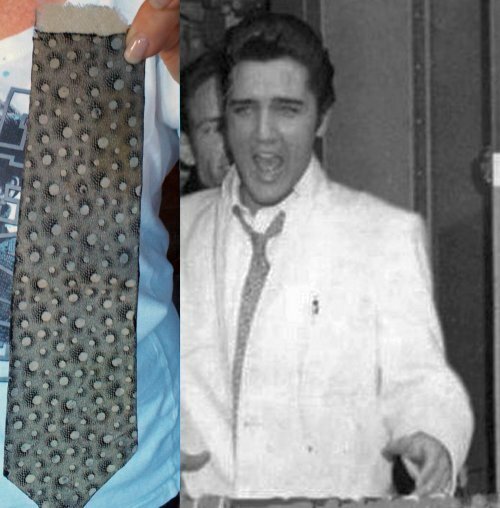 Elvis then said to me " I will give you my tie" ( as there was nothing left in his pocket... :). Of course, my 2 friends also wanted a tie, but he said they were packed. Then he asked one of his buddies for a knife so the tie could be cut into 3 pieces - and he signed each one! I got the best section! Elvis let us come back to his cabin at least 3 different times and was always kind and welcoming! He let us stand behind him when greeting fans at a later stop! This was a very special and treasured memory for me and one that I have shared for many years with family and friends! Naturally, I am a big fan and am looking forward to my second visit to Graceland later this month with Karen and another girlfriend. Be sure to visit the Topeka page and read the email that initiated this correspondence. All photos on this page unless otherwise indicated are the property of the designated persons or organization.